Kayaking is a type of water sport with a lot of fun. You can take part in this sport alone or with other skilled kayakers. However, have you ever considered your partner in crime to be your kids or your favorite pet? This does sound risky, as kayaking is an activity performed on the water. The good news is, it is not impossible once you know the best ways of tackling them. In this article, we will be sharing with you the important things to consider when kayaking with kids or with a dog. 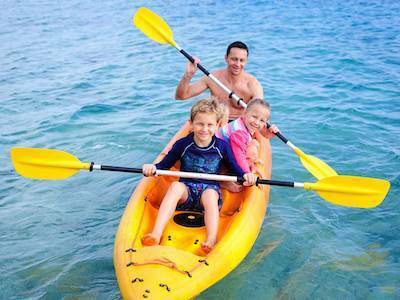 1) Kayak styles - Which is best for you and your kids? 3) Have your kids learned paddling? Most kids will develop an interest in kayaking straight away. However, without the guidance of adults, they may struggle during the trip. Here are some ways you can consider to prepare before hand and help guide your children. Kayaks are of various types, and we think that the best one for this scenario is the sit-on-top model. In some other types, the kayak’s body can be an issue in providing space for the legs. However, you will not find this problem in the sit-on-top design. Inflatable kayaks works well too as they are compact, portable and durable. Some users like the sit-ins. One major demerit is that you may not be able to manage these kayaks easily while getting flipped. Due to the absence of any cavity in the sit-on-top designs, there is no risk of water filling it. While the river wave hits the kayak, the water easily comes out of the holes. Thus, when you are with your kids, this type of kayak will help a lot. Another notable advantage of this model is that you can get in and get out of the kayak very easily. This kayak looks like a platform, floating on water. Tandem or single kayak? When your kids are below ten years, it’s best to share the kayak with them, as they need more guidance from you. Thus, investing in the tandem kayak is the better option. 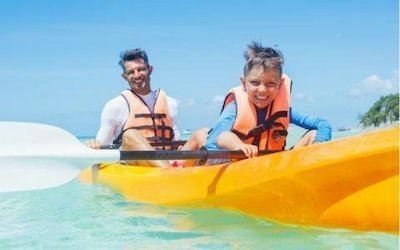 However, if you want your child in a single kayak, you have to ensure that he is able to do paddling without your assistance. How much distance should you cover with your kayak when with your kid? You have enjoyed kayaking with some other adults, and surely can cover a good distance with them easily. Teach your kids with the right technique for paddling the kayak. Your instructions will help them in avoiding any strain on their arm, back and neck. The kids have to keep their body straight while sitting on the kayak. They must hold their paddle the right way. If you are looking to get one, check out these paddles! The paddles of kayaks are of different sizes. For kids, you may choose those that are 200 cm in length. The shaft has to be narrow in design. This article will help you decide how to choose the right size. A river, having no wave or gently running water, is the best choice. For the first trip with kids, you can choose the small, protected lakes or bays. This will be a good opportunity for them to develop their skills. You can take them to different water bodies at different times. However, make sure that you are aware of the tides and water current of the river. A good practice is to try testing out the river first before bringing your kids along with you. If you are looking for a good river kayak for you and your kids, we recommend this model. The weight of the user is the major factor when choosing the PFDs. There are different PFDs for infants, having 8 to 30 lbs. of weight and for children with 30 to 50 lbs. of weight. Neck pads are highly essential while using kids’ PFD. The pads helps keep up the correct position of the child’s head. Most kids don’t like to wear PFDs. However, you must tell them about its importance. This article will show you how they work. In most kayaks, there is a storage cavity for storing foods. Thus, it is possible to store some snacks for your kids. There are also cup holders to store the drinking water. You must take all these essentials to start your kayaking journey. Other important things to consider getting for you and your little partner are sunglasses, long sleeves and hats. These items help you get protection from the effect of sun-rays. You should also pack bathroom essentials, waterproof boots and rain gear in your bags in case it starts to rain. This scenario is quite different when compared to kayaking with kids, as your pet dog cannot help paddle your kayak. Nonetheless, it is still very interesting to choose your lovely canine pet as your partner for kayaking. Your dog may be one of your trusted friends. For a short outdoor trip or a long hiking journey, your dog always accompanies you. However, it can also make your kayaking trip highly adventurous. With the right precautions and special techniques, you will enjoy kayaking with your cute pet. 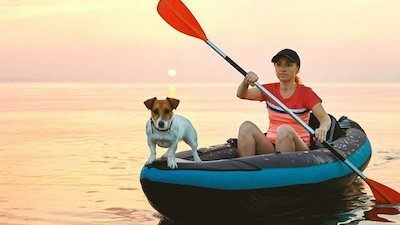 You have to focus on a variety of factors for a safe and enjoyable kayaking trip with your dog. Here are some things to consider. It is very easy to identify whether your dog species is the large or small type. The stronger, bigger dogs have a bigger chance of capsizing your kayak. They can be very active and you may not be able to control them. 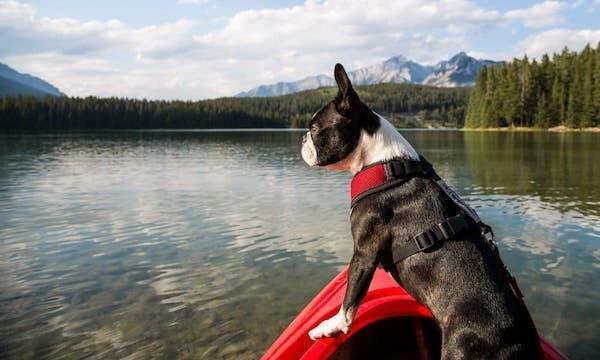 A smaller dog will be easier for you to take for kayaking trips. Your kayak has a very limited space. Most of the dog species do not like to remain confined within that space. If you have a bigger dog, this might be a problem. Luckily for you, kayak like this one are specially made for them. Some of them may not love the river. Thus, it is important to understand its personality. All dogs have different traits and attitudes. Some of them try to keep away from water, while others are hyperactive. Some also have a higher chance of becoming nervous. If your pet dog happens to behave as mentioned, it will be better to leave them at home. The size of the kayak may scare your dog. After all, your pet is seeing this type of boat for the first time. You must give your pet a chance to become familiar to your kayak. You may need to spend quite a fair amount of time for it. Take the kayak to different places. For instance, you can place it in your garden or in certain rooms at your house. You can then ask the dog to sit on the kayak. Make sure that your pet is feeling comfortable while doing so. The commands, common to most of the dogs are- Stay, Sit and Down. Your dog must also be familiar to these commands. It has to listen to your word so that you will easily be able to manage it once on the kayak. You can try to increase the number of comprehensible commands for your dog. To get the dog into the kayak, you may use the word- Up. Similarly, to get out of the kayak, you can say- Out. Choose your own language and help your dog learn faster. The kayaks are of various sizes and shapes. You can choose a bigger sized kayak that accommodates you and your pooch. The lively and active dogs may need larger space. Some dogs love sit-in kayaks, while others like the sit-on designs. PFD- Although your dog may be a good swimmer, they are always a chance of drowning. To prevent any tragedy during your kayaking trip, you have to put a life jacket on the furry dog. Leash - While you are on land, you can control your dog with a leash. It is important to make sure that you must not tie your pet to your kayak. Your kayak may flip any time and you will not have enough time to untie your dog instantly. Thus, take off the leash to avoid this catastrophe. Harness and collar - Your pet can jump off your kayak. The harness and collar is useful for pulling the dog back onto the kayak. Sunscreen - You have applied sunscreen lotion on your own skin. What about your pet dog? 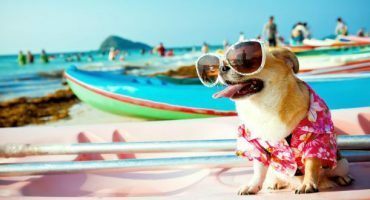 Do not think that your dog’s furry body has no chance of getting sunburnt. The bellies and nose of the pet can burn easily. Nothing to worry about as there is a special sunscreen for the dogs as well. Food and water - While you are going to have a long kayaking trip on the sunny days, remember to take water and food for the pet. Toys- It is better to have some dog toys for your pet on the kayak. While the dog is feeling bored, he can play with those toys. Kayaking with kids or with a dog is considered as a special situation to all kayakers out there. Therefore, make sure you read our guide above thoroughly to know the best ways for making the overall trip enjoyable. Like our article? Feel free to share it with your friends too!